This program changed my life and my families life. We now cook almost every meal together and my kids are so much healthier eating clean. I'm skinnier and healthier than I was in high school and it's all thanks to the amarillo office and the wonderful docs I got to work with. You will always succeed with people like them in your corner every step of the way. I hate dieting, but this program made it almost acceptable. I have done 4 rounds, and planning on a 5th. I still hate dieting, but i know this works. I know it is all up to me to keep it off, but I know the NutriMost office is here for me if I need them!! They give no judgement, EVER!! 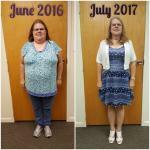 I lost 28 pounds in my first weight-loss round. I was very successful in keeping it off during the 4-week maintenance period between the two weight-loss periods. I have lost 18 pounds so far in this second program and have two weeks left. This is the best program I have ever tried...easy to follow, no hunger, lots of energy, and successful. I can't say enough good about the staff in Wesley Chapel...very helpful, friendly, and they want you to succeed. Thank you for my new lease on life. I love the social nature of this office as well as the program. Encouraging members to meet and get to know each other provides an excellent support system for those who don't want to sit online and blog to communicate with other participants. The staff is wonderful! I am so grateful for Mayra, Dr. B, and this amazing program! I am honored to have the opportunity to share about my experience with Dr. Benkert and Mayra at the Costa Mesa Nutrimost. Both of these ladies have been incredibly supportive and helpful both during and after my program. To this day, I know that if I have a question or a concern, I can contact either one and will have a response within just a few hours (usually less than an hour). I would happily recommend this program to anyone who is looking for a way to get healthy and stay healthy. I would recommend this office because they are in it with you, every step of the way. My husband and I did this together and we both lost all the weight we wanted to. We are very happy with our results.